The anti-government protests that forced the closure of 11 percent of Thailand’s polling locations left the Eastern Seaboard largely unscathed, with voting in Sunday’s national election proceeding smoothly across the region. 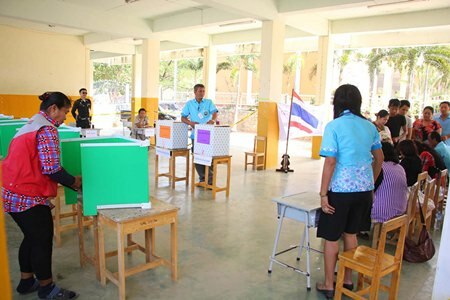 Incidents at two East Pattaya ballot boxes – including the discovery of a dummy hand grenade – marked the only disruptions in Chonburi for voting for new members of parliament and neither forced the polls to close. Chonburi Gov. 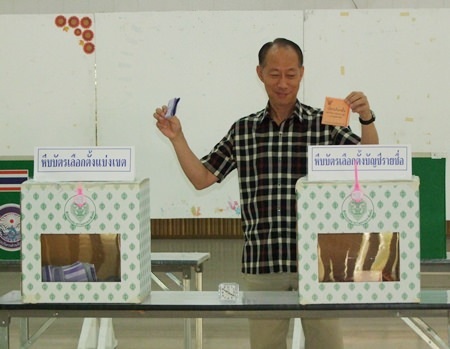 Khomsan Ekachai casts his ballot at the Bang Pla Soi Sub-District. The situation in the east stood in stark contrast to conditions in 16 provinces where voting was either canceled entirely or at selected stations. 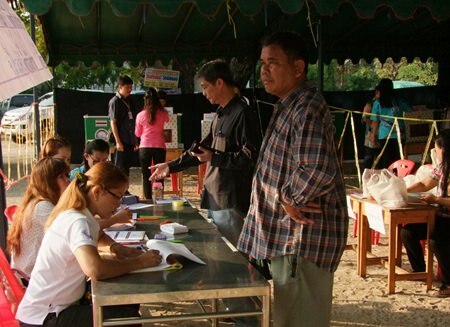 The Thailand Election Commission said voting proceeded in only 89 percent of 93,952 poll locations across the kingdom. The E.C. cancelled voting entirely in 14 provinces in the South, including Trang, Phuket, Krabi and Phang Nga. 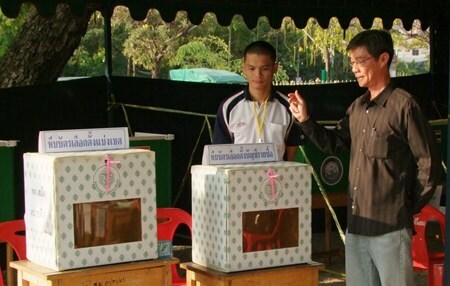 Another nine provinces, including Bangkok, could only open polling booths in some areas. 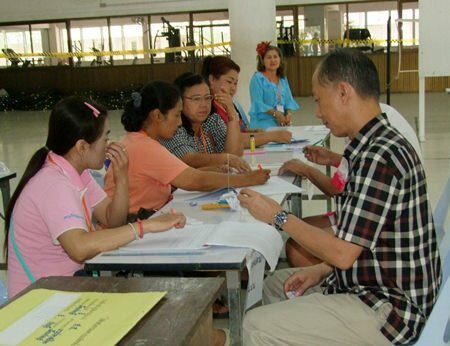 Mayor Itthiphol Kunplome casts his vote at Pattaya School No. 5. Total voter turnout – either due to closed stations or fear of violence at polls – led to record low voter turnout, with only 45 percent of eligible voters taking part. In Chonburi, only 28.3 percent of voters turned out while only 25.8 percent cast ballots in Rayong. In the last national election in 2011, 77 percent of Thais cast ballots. What appeared to be an M6 grenade in the parking lot outside the voting station at Nernplabwan School turned out to be only a harmless practice grenade. With insufficient numbers of MPs elected to seat parliament, the E.C. has scheduled another round of elections for Feb. 23. Meanwhile, the People’s Democratic Reform Committee vowed to continue disrupting any poll. No election results will be announced until all constituencies are full. The PDRC, which has closed down intersections and stormed government offices in Bangkok, was felt but not seen in Pattaya. Seven apparently sympathetic poll workers at the Nongprue Kindergarten station resigned on Election Day in an attempt to close the station. It didn’t work: Vote director Anukit Thongplang replaced all seven in times for polls to open. 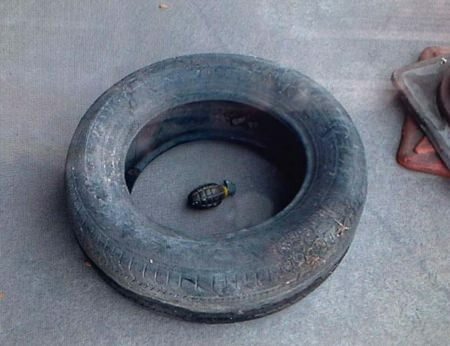 The threat looked more serious at Nernplabwan School where poll director Apsith Sukhontros found what appeared to be an M6 grenade in the parking lot outside the voting station. Police called to the scene discovered, however, that the “bomb” was only a harmless practice grenade. Investigators speculated it was left to cause panic and disrupt voting. Theerawit Thongnok, director of the Chonburi Election Commission, inspected the location and opened the station as planned, although voter turn out proved very low. Palang Chon Party candidates Santsak Ngampichet and Poramet Ngampichet turned out, however, to cast votes for their own re-election. Poramet faced Mahachon Party candidate Suphap Numnoi in the Region 7 election. The region contained 143 polling stations with 141,718 eligible voters. But by the time the polls closed at 3 p.m., only 33,924 had voted and, of those, only 15,356 were considered valid. 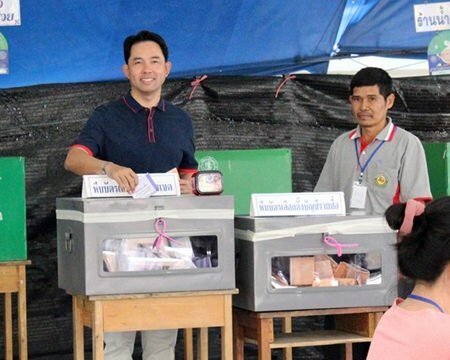 More than 10,000 ballots were spoiled, perhaps intentionally in protest, according to district director Theeravit Thongnok. 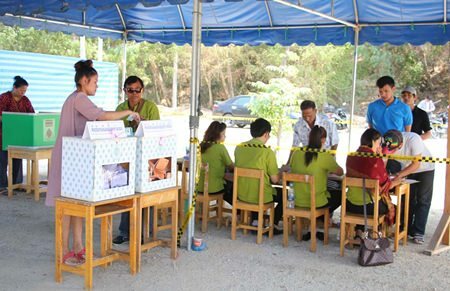 Chonburi Deputy Gov Pongsak Preechawit inspected polling places in Banglamung, Sattahip, Koh Samet and other Chonburi cities and reported that while voter turnout was low – 30 percent in Region 7 – voting had proceeded smoothly. Chonburi is divided into eight electoral districts with 1,379 polling stations and 1,001,146 eligible voters. Only 283,010 voters cast ballots. Chonburi Gov. Khomsan Ekachai cast his ballot in Bang Pla Soi Sub-District. He implored civil servants to be neutral in the ongoing political debate and take their family to vote so that they would be good examples of supporting democracy. The Chonburi Public Relations Department contributed to this report.